Ever since The Blair Witch Project way back in 1999, we've gotten a stream of found-footage horror movies with only a handful of decent gems in the bunch. Cloverfield and Chronicle have been the only ones I've personally liked enough to buy and rewatch. Now Afflicted joins that small but notable number as a smart and simple debut film. Afflicted is the story of two film-making friends, Cliff and Derek, going on a world trip because Derek has been diagnosed with a horrible brain aneurysm that could kill him at any moment. Along the way he meets an exotic French woman and trades one affliction for another- (SPOILER ALERT from here on) he slowly becomes a vampire. Of course with his new superhuman abilities comes a cost that takes it's toll earlier than expected. There's tests to his new found strength and speed, shows of his severe allergy to the sun and subsequent healing abilities, an unbelievably well executed SWAT chase, and even an obligatory small fight between two vampires. Once he learns of his true immortality it is implied that he takes to using it as a sort of vigilante quest, and there's a nice mid credit sequence that shows the consequences of not feeding properly which is mentioned in the film. In fact I had a small argument with someone about the ending, they felt it made Derek into a sort of villain, but he was choosing who to kill. Specifically choosing to eliminate what amounts to monsters in their own way instead of haphazardly slaying anyone. It was handled with extreme subtlety. This film has returned my appreciation for vampire horror films. 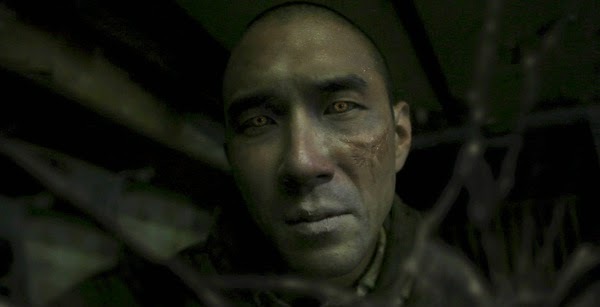 Afflicted may not win any awards, but it is definitely worth watching for any horror fans. The found-footage excuse is actually well handled as these two film-makers are chronicling their world tour journey for a website, and it even has repercussions in other characters use it as evidence and a sort of tracking element that I haven't seen yet in any other similar film. They clearly had a small budget but make grand use of what little they got to make a decent movie. Sure there's simple camera trickery, shaky cam, conveniently recorded moments for the plot, and plenty of quick cuts- but the film has enough originality and convincing material to keep it interesting and entertaining. I sincerely hope Clif Prowse and Derek Lee co-write and direct something with a larger budget where they might not have the constraints of small time film. They've done extremely well for acting, writing, and directing for being essential first-time creators, nothing too amazing, but they now have gained a chance for growth in all areas by proving they can do something great with nothing. Hahaha, it did seem a bit like it.